Studies have confirmed the presence of large numbers of T lymphocytes in the dermis of LE (Synkowski et al. 1983). 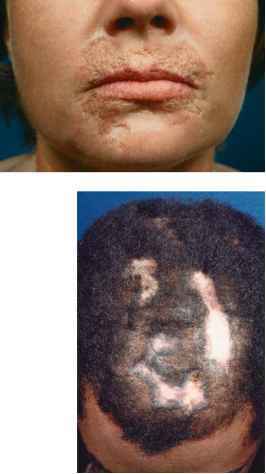 LCs are diminished and IDECs are almost absent in the epidermis of LE lesions. Instead, PDCs seem to accumulate in lesional epidermis and dermis (Farkas et al. 2001, Wollenberg et al. 2002). In the dermal compartment, DDC numbers are increased (Mori et al. 1994). In terms of LE pathophysiology, PDCs may be regarded as the most interesting DC type because of their accumulation in the skin lesions of LE as well as their capability to produce type 1 IFN. It is unclear whether the decreased number of LCs and IDECs in the inflamed epidermis is causally linked with the epidermal accumulation of PDCs. Further investigations are warranted to clarify the complex and difficult interplay of several immunologic factors and cells in the pathogenesis of LE.